Filing a patent is relatively expensive in time and effort; defending it can be even more costly. Patents can also reveal a lot to competitors and it may not be so easy to police infringers. So in the long-term companies learn when to file or to not file, and when to reveal what might have given them an advantage in coming up with the invention. The fact that HSP are included in a large number of patents spanning decades, and are still being included at a high rate in 2016 says a lot about the usefulness of HSP. If they didn't work, they wouldn't be included in so many patents. How many? A search for the phrase "Hansen Solubility Parameters" in Google Patent Search results in more than 20,000 hits! 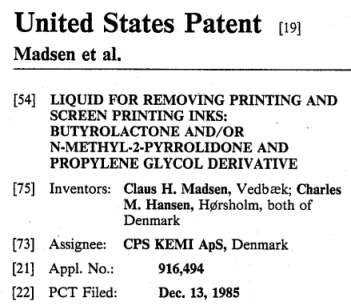 A similar search for "HSPiP Hansen" reveals >500 patents that cite the Hansen Solubility Parameters in Practice package. On Hiroshi's Japanese-language Pirika pages he regularly cites recent HSP-based patents. His many loyal corporate readers find these citations very useful as they spark fresh ideas within their own corporations.